If I've learned anything in the last two years since becoming a wife with a full-time job, it's that meal planning saves time, money and my sanity. Although it can take some time to get into the swing of it and learn a rhythm, it's so worth it when you do because you won't be left stuttering when your hubby or child says those infamous words, "What's for dinner?" I've put together a list of tips that have helped me journey through meal planning. It's all about trial and error and what works for you. This seems like an obvious statement, but it's the most important part of meal planning for the week. I like to sit down on Friday or Saturday with my calendar and first go through the weeks events. Do we have small group meeting, social event or appointment after work? Obviously this is going to cut into dinner making so on a night with an event I might make a crockpot meal so it's waiting for us when we get home. Have everything pre-planned for the week written in so you can plan accordingly. Routine gets boring so don't always play it safe when meal planning. I like to try one new meal each week. Something I've never made before. Sometimes it works, sometimes it doesn't. But occasionally we get a new favorite to add to the list. Have a variety of options to choose recipes from. I like to grab a couple of cookbooks, the TIU nutrition plan and bring up Pinterest to gain inspiration for dinner. I try to make sure no meal is the same throughout the week. I always check my refrigerator and my pantry for what I already have and what needs to be used. So often I forget what I buy and those items with expiration dates of course get tossed. Ouch! So take a peak through your cabinets and see if you can create some recipes out of items you already own. After you've chosen all of your recipes lay them out and write down what you need to buy to create these recipes. Make sure to put correct quantities because nothing hurts like coming home to make a meal and realizing you needed 3 cans of tomatoes, not one. Also, don't deter from your list. Stick to what you need or else you'll spend more than necessary and most likely waste it. Sometimes I've planned a meal that we just aren't "feeling" the night I planned on making it. So I always keep a frozen pizza or lasagna around for those just in case moments. I find it harder to stick to a meal plan now that I'm pregnant because of my fluctuating cravings so sometimes I just end up eating a pb&j, but I then just push my pre-planned meal down the line for the next unplanned day. I like to write down the entire weeks recipe plans in my Whitney English planner since it has that cute little spot for "Dinner". The day before I'll check my planner to see what's up on deck for the next meal. That way I'm prepared to defrost, precook or prep anything that needs to be done ahead of time for our meal. Taking time to meal plan is tough work. Give yourself a pat on the back and reward yourself by enjoying your meal(s) with a glass of wine (or in my case sparkling water). Do you meal plan? What has worked for you? 13 comments on "What's for dinner? 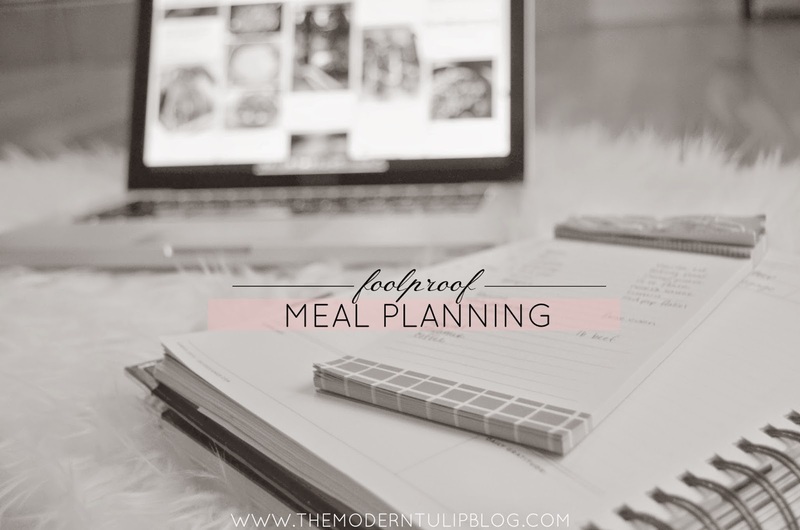 || Fool Proof Meal Planning"
Love these tips! I'm usually pretty good about planning ahead and making a list, but can definitely improve in using what I have. I just bought way too much garlic this weekend even though I still had some hidden away in the back of the veggie drawer...oops! I pretty much do the same type of thing, if not I end up throwing loads of food away. I find it works out really well! I am soooo guilty of wasting food because I forgot about it until its past the expiration date.. so frustrating! I love the idea of writing down meals in your planner, I have a Erin Condren one that would be perfect to do the same. Meal planning is the best!! We rarely have a back-up plan, so I'm going to incorporate that for sure!! I definitely try to plan ahead and I almost never have a back up plan. Probably something I should have though since I've needed it on several occasions! Sometimes it's so hard figuring out what sounds good for dinner a few days in advance though! these are excellent tips! I really need to try this out! Great tips. We do this on and off. More off lately... Want to get back into it! I love meal planning and live by it! It's my goal to sit down this weekend and bust out one for the next month! Well, I laughed out loud as I read this. I literally do every single one of these as well. From the Friday planning, having a backup, trying a new recipe every week, keeping it all in my planner so I can have everything prepped/thawed. This is getting comical, we're the same person with different colored hair. I so need to do this - what is it they say if you fail to plan, you plan to fail? that is me on the weekly - I have good intentions and start the week well and then slowly fall off the bandwagon. I just need to follow some of your ideas here...maybe it will work. Oh, and thanks for sharing! Tour Through Blogland || Next Stop, Here.